Summer in the greater South Bend area is well underway and bringing light to new growth. From road construction across the county to the repurposing of old factories in the heart of South Bend, growth is everywhere. Inside Family & Children Center, growth takes form as families continue to enroll in our programs, both Healthy Families and The Brain Train and victories outweigh our defeats. We’ve had our ups and downs as an organization, but one thing is clear, just as you are committed to us, we are committed to our serving our community through our mission – building strong families and healthy children. It is this mission that inspired and empowered me to assume the board-appointed position of Executive Director of Family & Children’s Services. We have reached over 1,000 families in St. Joseph County, including one mother you will read more about. We go into homes, warmly and with a willingness to listen; we welcome families to our The Brain Train play area, always with a smile and positive reinforcement. This is how we plant that seeds that lead to our families’ growth and development. As you read through our latest newsletter, know that you have made a difference, that you helped us “water the garden” of our organization. If you haven’t yet, you still can! Find out more about how you can make a difference, and help us grow. This began 2015 for Sandra, a Brain Train client and hardworking mother of four children, two young sons and two school-age daughters. Sandra spoke of how, as the year went on, Aaron began to hit other kids and would not talk to them. When she tried to have a conversation with Aaron, he would often ignore her. Balancing the behavioral habits of her older son with the infant needs of her youngest child was a challenge. Sandra began to search for solutions to help her son be happy. In August 2015, Sandra discovered The Brain Train, one of Family & Children’s Center’s early childhood programs. She and her young sons began participating in weekly play sessions. Through productive play, The Brain Train staff began showing Sandra positive discipline that transformed Aaron’s behavior and Sandra’s family. 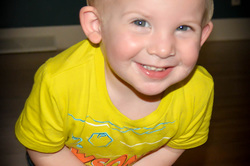 Aaron became much more receptive to positive reinforcement, and he is interacting well with his brother and his peers. This is the difference impacted by Family & Children’s Center: inviting all families to become resilient, happy, and healthy. Being a parent is a tough job. Parenthood becomes even more challenging when one has no car, limited resources, an income well within the poverty level, no childcare, and possibly without a partner to provide support. Amid this, so often lacking is a basic support system where parents can share resources and friendship. Healthy Families and The Brain Train provide aid to parents like this through their in-home and on-site services provided individually to families. Now, through a newly launched Parenting Group, Healthy Families and The Brain Train are bringing these parents together for a monthly meeting of community and education. Launched in January 2016, the Parenting Group meets monthly on the fourth Thursday of the month from 1:00-2:00 at Family & Children’s Center. The entire family is invited! Participants come together for a meal and ice-breakers, enjoying delicious food while sharing in community. 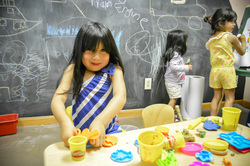 After the meal, kids engage in age-appropriate activities while parents participate in a presentation and discussion. Topics have included a discussion of Myers Briggs personalities and what this means for how one goes about parenting and interacting with one’s partner. In another meeting, our Brain Train Program Manager Courtney Carroll shared fun, nutritious cooking ideas that parents can do on a budget with their kids. The entire family joined in creating these tasty treats! Upcoming topics include positive discipline strategies, information on area resources for financial assistance, infant/toddler safety, and stress management. For more information on how to get involved or support the Parenting Groups please contact marketing @fccin.org or 574.968.9660. At age nineteen, Jada had three children when she learned she was pregnant with her fourth child, a sweet baby girl. The father of her fourth child was in and out of Jada’s life with no consistent commitment or support. At the time, Jada worked part time at a local fast-food restaurant. Her income was supplemented with social benefits, but, money was still tight. Jada did not own a vehicle to drive to work or appointments. Pregnant, overwhelmed, and without a high school education to help her achieve stable employment, Jada turned to Healthy Families for support. This is where Healthy Families support specialist Sonya Swan came in and opened doors in Jada’s life. Sonya had been with Healthy Families St. Joseph County for two years when she first met Jada. Over the course of their initial meeting, Jada opened up to Sonya, sharing about her struggles without a high school diploma and her desire to graduate and find meaningful, full time employment. Yet, the cost of school and quality childcare was a barrier, not to mention the cost of reliable transportation. Amid this, Jada was overwhelmed by the birth of her fourth child without steady support from the father. 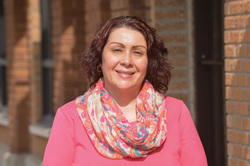 Sonya was familiar with a program that provided free diploma classes to young mothers, provided transportation, and provided enrichment activities while the mother was in school. By the end of her three years with Healthy Families, Jada was able to reach her dream of achieving her high school diploma. She also gained confidence as a mother, learned about her baby’s growth and development, had access to resources for how to cultivate the growth of all four of her children, and had a listening ear. Sonya Swan, alongside our other support specialists, truly makes a difference in our community, working to give every family the happiness, health, and resilience they deserve. The old adage says that it takes a village to raise a child. 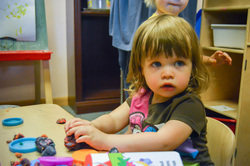 Well, one thing we know for certain at Family & Children’s Center is that the Michiana community is filled with resources to help families become happy, healthy, and resilient. Healthy Families and The Brain Train partner with a plethora of agencies to help identify and provide the resources each unique family can utilize as they strive to become the best family they can be. One of these agencies is REAL Services. REAL Services is the Community Action Agency and Area Agency on Aging for North Central Indiana. With a mission to maximize the independence of people of all ages, REAL Services has been working with Healthy Families St. Joseph County and The Brain Train to provide clients from all agencies with the tools they need to excel. We connected with LaTasha Bosse, Family Development Coordinator at REAL Services, to learn more about how this partnership has been beneficial to their clients. Since 2012, LaTasha has been on the advisory board for Healthy Families and The Brain Train. It is this symbiotic relationship of referrals and resources that helps these families connect with all the tools available to enable them to lift themselves out of poverty. Here at Family & Children’s Center, we provide over 9,000 referrals to local human service agencies annually. Thank you to REAL Service, and to all our partners, for continuing to help us build happy, healthy, and resilient families!